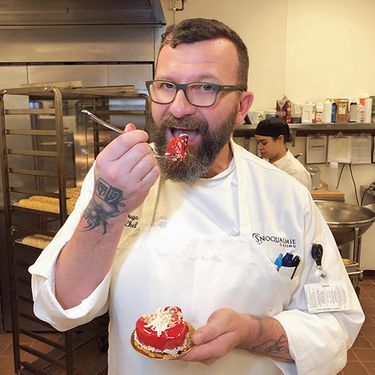 It’s not often one finds inspiration for dessert in a skull — especially when the dessert is in celebration of Valentine’s Day — but Snoqualmie Casino’s Executive Pastry Chef Chuck Dugo has always had a bit of a dark side. “I was a goth kid, and that’s still a part of me,” he says. The skull in question belongs to St. Valentine, the Roman priest who was martyred in 226 A.D. Although there are many stories surrounding the history of St. Valentine, one of the most popular is that he was imprisoned and eventually beheaded for marrying Christian couples who were being persecuted by the emperor Claudius. He died on February 14 and has since been associated with love; modern-day Valentine’s Day began as a feast in his honor. “There’s a cathedral in Rome that supposedly is housing St. Valentine’s skull. It’s a little bit graphic, a little bit gory but at the same time it’s a great story. His skull has a dried flower wreath over his head, and it’s encased in this really ornate gold box. It’s pretty stunning, and it’s just so human,” Dugo says. 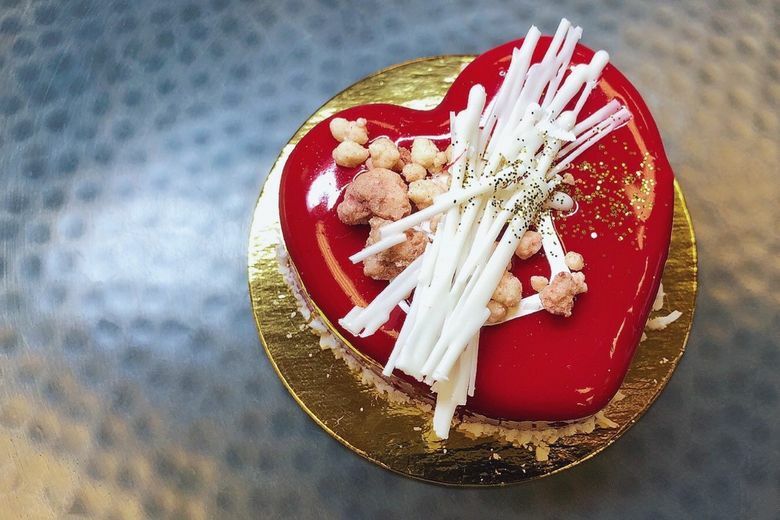 This doesn’t mean that while dining at Snoqualmie Casino with your love this Valentine’s Day you’ll be presented with an ornate skull after dinner — instead Chef Dugo looked at photos of St. Valentine’s skull online, sitting in its ornate golden box and to him, it meant emotion. 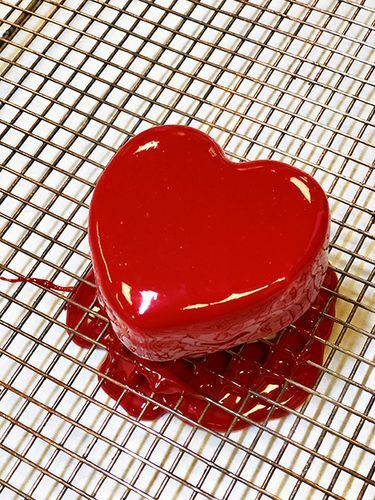 He channeled those feelings of emotion and translated it into a heart-shaped flourless chocolate soufflé cake with roasted white chocolate mousse, a raspberry milk crumble and a mirror glaze. Topping things off are a St. Valentine’s banner printed with edible ink (and similar to the St. Valentine banner that sits atop the real skull in Rome), and a flower. Chef Dugo says when looking to create desserts in conjunction with specific holidays he likes to look to the origins. “I find inspiration in the root of it, as opposed to the current version of the holiday,” he says. Channel your own ambition into Dugo’s heart-shaped creation by following the recipes below, or head in to Snoqualmie Casino and order one of his. 1. Lightly butter the heart molds. Place molds on a flat sheet pan lined with parchment paper. Reserve. Melt and hold chocolate at 110 in a double-boiler over simmering water. Whisk in butter. Remove from double-boiler. If this mixture starts to get cold and harden, rewarm in the double-boiler. Separate eggs, making sure none of the yolks get into the whites. In a mixer bowl, combine yolks with half of the sugar and whip to triple volume. Transfer this mixture to a large bowl and set aside. Combine the whites, the remaining sugar and salt in a clean mixer bowl and carefully heat them, whisking occasionally, over simmering water to about 120. Remove from heat and whisk on medium-high speed to soft peaks. Fold egg yolks mixture into chocolate mixture then, in thirds, fold meringue into chocolate mixture. Divide batter evenly between the eight molds. Bake at 350 about 20 minutes or until dry and matte on the surface. Place cooled cakes, still in the molds, in the freezer at least 2 hours. Heat cream in a pot over medium heat. Do not boil. Remove from heat and transfer cream into a bowl. Melt chocolate, in a bowl set over simmering water, to 100 degrees. Make sure it doesn’t go above this temperature; if it does remove it from heat and let it cool to desired temperature. Add warm cream, a tablespoon at a time, to chocolate and stir using a rubber spatula in concentric circles to form an emulsification. Continue this process until both are mixed well. Do a final mixing using a whisk or immersion blender. Place plastic wrap directly onto surface of mixture and place in refrigerator to cool to 40 degrees. Whip mixture to stiff peaks making sure it’s not overwhipped and visually grainy. Reserve in refrigerator until ready to assemble cakes. Combine 25 grams powdered milk, flour, cornstarch, sugar and salt in a mixer bowl. Whisk to blend. Add melted butter to this mixture and whisk on low speed until blended and small “pearls” form. Transfer pearls to a sheet pan, spread out evenly and bake at 250 degrees about 20 minutes or until it just starts to get some color. If larger pieces exist, allow to cool then cut down to ¼” pieces. Transfer pearls into a large bowl and toss together to evenly coat the pearls with 12 ½ grams powdered milk. Pour in the warm chocolate and toss to coat evenly. Transfer this mixture to a flat sheet pan lined with parchment paper and break apart any large clumps. Continue moving the pearls around as the chocolate starts to harden, to create small, ¼” pearls. Store these in an airtight container, frozen, up to one month. Whisk together water and gelatin in a medium-sized pot and allow to bloom for 5 minutes. Whisk in sugar, condensed milk and glucose over medium-low heat. Melt till gelatin and sugar are dissolved. Pour over white chocolate, let sit 5 minutes and process well with an immersion blender. Add coloring and blend again. Strain to remove bubbles. Store in refrigerator up to one week. 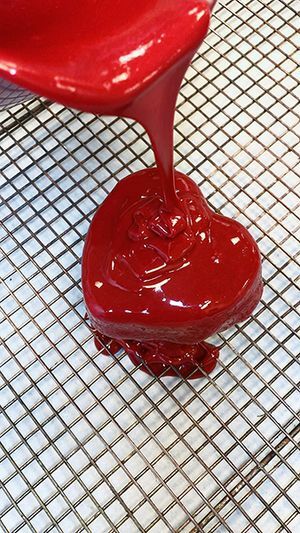 Gently heat to 95 degrees to use as a glaze on frozen or refrigerated heart cake. Put raspberries in a bowl, add a little sugar and smash with a fork. Set aside. Gather the cakes from the freezer, the mousse and milk crumble. Put some mousse in a piping bag and cut the tip off. Pipe the mousse in an even layer on the cake while still in the mold. Fill it to the halfway point. Using the backside of a soup spoon, make an indentation in the center surface of the mousse to create a space for ½ tablespoon smashed raspberries and ½ tablespoon milk crumble. Finish piping mousse to the top then level off using the back of a chef’s knife or an offset spatula. Refrigerate at least an hour or freeze up to a month. Release the cake from the ring by running a paring knife around the inside edges of the ring mold. Warm the outside of the rings using a propane torch or by dipping into a bowl of hot water, being careful to not heat so much that the mousse melts. Lift the rings up and off.